A group of peacocks isn’t called a flock, but a party. 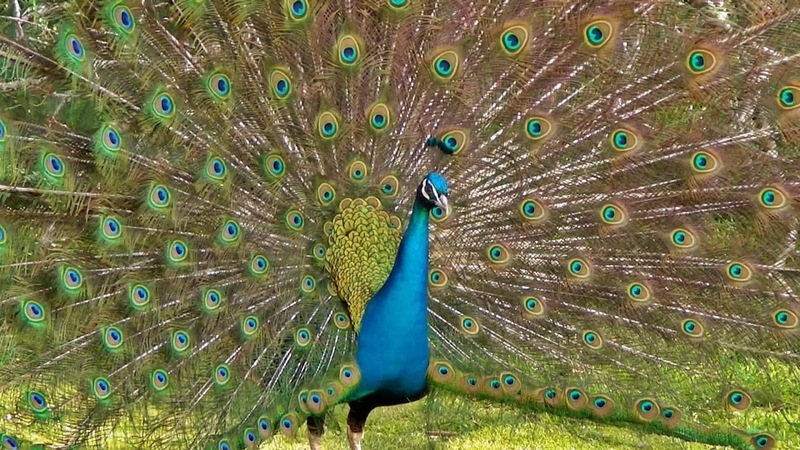 Peacocks have been kept as pets for thousands of years. The Congo peacock does not display his covert feathers, but uses his actual tail feathers during courtship displays. These feathers are much shorter than those of the Indian and green species, and the ocelli are much less pronounced. Peacocks eat seeds, plants, insects and small reptiles. The term “peacock” is commonly used to refer to birds of both sexes. Technically, only males are peacocks. Females are peahens, and together, they are called peafowl. Peafowl are members of the pheasant family. The natural predators of peafowl include mongooses, jungle cats, stray dogs, leopards, and tigers. The IUCN Red List of Threatened Species categorized Green peafowl as an “endangered species” in 2012. The function of the peacock’s elaborate train has been debated for over a century. In the 19th century, Charles Darwin found it a puzzle, hard to explain through ordinary natural selection. His later explanation, sexual selection, is widely but not universally accepted. Multiple hypotheses attempt to explain the evolution of female choice. Some of these suggest direct benefits to females, such as protection, shelter, or nuptial gifts that sway the female’s choice of mate. Another hypothesis is that females choose mates with good genes. Peafowl such as the blue peacock have been admired by humans and kept as pets for thousands of years. A group of peafowl is called a party, muster, ostentation or pride. The Indian peafowl is the national bird of India and is protected in that country. In the Hindu religion, the peafowl is a sacred bird, because the spots on the peacock’s tail symbolize the eyes of the gods. Peacocks are mentioned in the Bible as one of the most precious items brought from Asia by King Solomon’s ships. can’t stay airborne for very long, but their huge wingspan allows them to flutter quite far. There are 3 peafowl species; two Asiatic species and one African species. The Indian peafowl or blue peafowl (Pavo cristatus) originally of India and Sri Lanka, the green peafowl (Pavo muticus) of Myanmar, Indochina, and Java and the Congo peafowl (Afropavo congensis) native to the Congo Basin. Their natural habitat is the forest or rain forest. Peafowl can live in the wild for up to 20 years. Domesticated peafowl have been known to live as long as 40 to 50 years. Peacocks can fly, but they stay on the ground most of the time. having shorter upper tail coverts, a more coppery neck, and overall less iridescence. Female peacocks are actually peahens, not peacocks. Babies are peachicks. In India, peacocks are considered sacred. Peacocks are a larger sized bird with a length from bill to tail of 140 to 160 cm (55 to 63 in) and to the end of a fully grown tail as much as 180 to 250 cm (70 to 98 in) and weigh 3.8–6 kg (8–13 lb). The females, or peahens, are smaller at 90-110 cm (35-43 in) in length and weigh 2.8–4 kg (6–8.8 lb). The peacock has some of the brightest feathers and one of the most impressive courting displays of any bird in the world. The Indian peacock has very flashy plumage, with a bright blue head and neck. The peacock “tail”, known as a “train”, consists not of tail quill feathers, but highly elongated upper tail coverts. These feathers are marked with eyespots, best seen when a peacock fans his tail. The Indian peahen has a mixture of dull grey, brown, and green in her plumage. The male needs his bright feathers to attract a mate, and the female needs to be able to blend in with the bushes so that predators cannot see her while she is incubating her eggs. centimeters (51 to 63 inches). Peacocks have a top running speed of around 16 km/h (10 mph). Peacocks have elaborate feathers to show dominance and to attract peahens for mating purposes. The prettier the peacock, the more peahens he attracts by strutting around and shaking his feathers. Once mating is done, the female bird gathers various materials to create a nest. Males look for other peahens to mate. Most nests are on the ground while some of them roost in trees. Peahens will lay anywhere from 3 to 8 eggs, which incubate for about four weeks before hatching. The name of a baby peafowl is a peachick. The peachicks are able to walk and forage on their own right after they hatch, but they are very vulnerable. It takes two weeks before they can flap up into a tree for safety, where they crowd on both sides of their mother and are covered by her wings. Peafowl are omnivores and eat mostly plant parts, flower petals, seed heads, insects and other arthropods, reptiles, and amphibians. on the end of sticks! shrieking sounds to alert each other of danger. several peahens or all bachelors.